Folding handcarts are ideal for moving around heavy boxes in a warehouse or even storing in your garage on a peg hook when you need to haul the occasional heavy item. The great thing about these handcarts is that they serve a variety of purposes. Whether you are a touring musician schlepping guitars and speakers, a mom hauling groceries in from your car, or a DIY hobbyist who needs a rugged, but light-weight, hand cart available in a pinch, they are collapsible and easily stored away in your home closet. Even on airplanes where they can fit in overhead compartments! 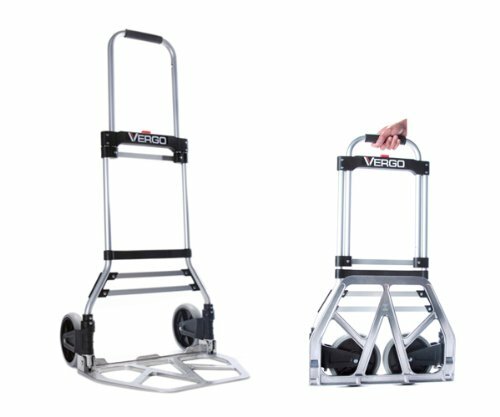 The Cosco hand truck has the highest weight capacity at 300 lbs., with the Vergo in second at 275 lbs., and the rest at 150 lbs. Ideal for trade shows, family reunion picnics, camping adventures- any of these carts are easily able to transport heavy boxes, luggage, groceries. Anything unwieldy item that you can think of- though they're not great for hauling small, loose items because they might fall through the bottom. The 14.9 lb. Cosco Heavy Duty Folding Hand Truck is our top pick- It has the unique ability to convert to a dolly, as well as serve as a handtruck. One user describes hauling his public address music system with this Cosco handcart- writing that it makes it much simpler to travel to remote music festivals and perform. He did actually replace the rubber wheels with larger ones, bolting them on for a stronger tread. Other users love the 2 in 1 functionality of this Cosco cart, saying that it's ultra-convenient to have a commercial-strengthen dolly at your disposal as well as a handcart when you need to transport exceptionally heavy items. Other users commend the collapsibility, its overall sturdy construction, but they do say that it is a little bit heavy and the lime green color isn't to everyone's taste. Another user with a large family says that she stores her's in the back of her GMC Acadia Denali uses it to transport all of her groceries in one fell swoop into the house. Instead of going back-and-forth 4 or 5 times, leaving the garage door open to insects, now she just does one trip and it has dramatically simplified her shopping life. Indeed, many users find that the Costco cart serves multiple purposes, whether they are traveling musicians, warehouse workers, stay-at-home moms that use it for shopping purposes, or parents that are carting their college-bound kids off to university. 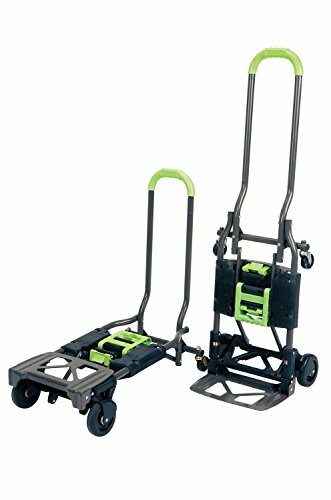 Definitely a solid option to consider if you are in the market for one of these portable folding hand trucks. Let's take a look at five of the best-selling options so that you can choose which is right for you. Hand trucks are useful for a lot of different things and this folding hand truck is one that could be used for home or office. The Magna Folding Hand Truck is designed for personal use around the home, office and even recreational use. This collapsible hand cart has a telescoping handle that is made of aluminum so it makes it somewhat lightweight. The handle of these folding hand trucks will extend to 39 inches and it has a wide aluminum base and 5-inch wheels made of rubber that require no air. This is one of those hand trucks that is compact and can fold down flat and is only 2.5 inches thick once folded which makes it pretty easy to store and to travel with. Those who have purchased one of these hand trucks all have commented on just how sturdy it is and that it can be used for a lot more than expected, some have even used it at work for hauling heavy boxes. Others who own this collapsible hand cart have found it great for both travel and camping because it can carry a ton of stuff and then easily folds down to such a small item that it can be stored anywhere. Some users have pointed out that although the wheels are great when it comes to making it easy to store and carry the pivot point is too far behind the load and it can throw off the balance of the hand truck. This is a folding hand truck and dolly that is designed for more heavy duty work with a weight capacity of up to 300 pounds. The Cosco Shifter Folding Hand Truck is one that has a quick conversion set up with no pins or tools required to change it from a standard upright collapsible handcart to a four-wheel cart when it calls for it. This is a heavy duty folding hand cart that easily will fold down flat for both transport and storage and should fit in most car trunks when transporting it. The overall weight of this hand truck is 14.9 pounds so it’s not too heavy and its dimensions are 13.8” x 16.6” x 49.2”. It can be used as both a four-wheel truck or dolly as well as an easy to use two-wheel traditional hand truck. Many people who own this folding hand truck like how versatile it is because it can be used as a regular dolly to move heavy items or it can be used as a cart that you can use to carry items stacked up like different sized boxes. Users have commented on how well built this hand truck is and that it’s extremely solid and sturdy. The only issues that some users have noted is that it feels a little heavier than other folding hand carts and that if you don’t position things just right in cart mode smaller items tend to fall through the cart. This steel folding hand truck that can open up instantly with just the touch of a single button. The Magna Cart Hand Truck is an easy and simple to use collapsible hand truck that is both sturdy and rugged and can be used as a hand truck for moving heavy boxes, suitcases, supplies, smaller pieces of furniture and more. It has a sturdy 19mm steel frame that will hold up to 150 pounds of weight and the wheels are retractable so that the frame of this heavy duty hand cart can fold down to just two inches thick. This makes it easy to store away. It is 16.5” x 16” x 39” and weighs only 9.7 pounds so it’s not a real heavy handcart so it’s easy for anyone to use. It also has 5” tires that are all rubber so there’s never any worry of the tires going flat. 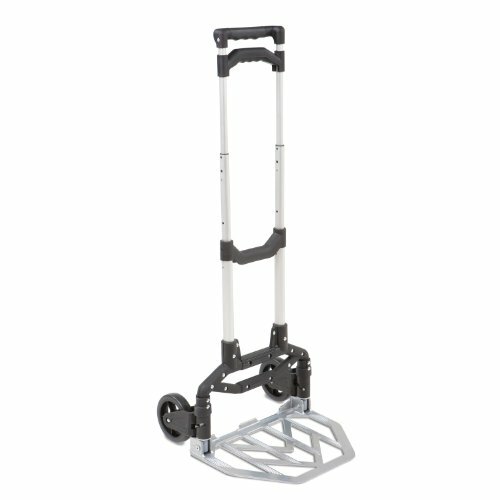 There are some who have bought this folding hand truck and have used it mainly for travel and have found that it works great to take with you even on a plane because it can carry pretty much everything you are bringing with you and because it folds down so small it can be carried onto the plane and put in the overhead storage. Others who own this handcart like how rugged it is and how easy it is to get the handle to telescope to the height needed as well as how quickly it can be folded down to store away. There were no cons to report on this product. This is a relatively inexpensive hand truck that has a weight capacity of 150 pounds. The Seville Classics hand truck and dolly is made of aluminum so it is both heavy duty but also light in weight making it easier to use for a lot of people. It was built for using in the home or at the office where there might be heavy supply boxes that need to be moved. This is a collapsible hand cart that has been built with ease of use in mind. This folding hand truck is one of those hand trucks that may be very light, weighing only 6.9 pounds but is still durable enough to carry up to 150 pounds. When it’s unfolded it measures 15.35” x 16.54” x 39.37” and when it folds down it measures just 15.35” x 2.36”. It has rubber wheels that need no air and they roll well on most any kind of surface. 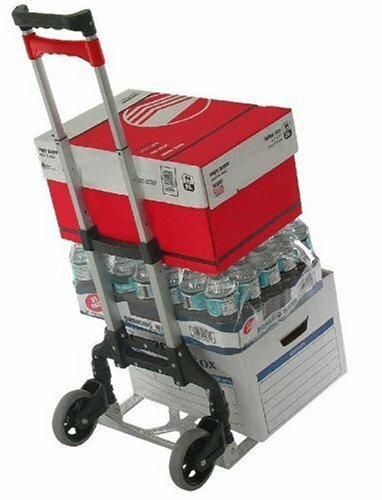 Some who have used this folding hand truck have found it good for moving a variety of smaller items that are still too heavy to just carry by hand especially books and office supplies so it could be a good item to use in an office environment. Those who have bought this hand cart like how well it moves over a variety of different surfaces, even in grass, it tends to do well. Users also enjoy how easy it folds down for quick storage taking up very little space. Some, however, have noted that it has a design flaw where the axis is too far behind the handle so when it’s loaded it tends to pull forward and can require some effort to counterbalance this so it won’t tip over. This folding hand truck dolly is a strong hand truck that can handle daily use of transporting a variety of items up to 275 pounds of weight. This collapsible hand truck is designed to use for a variety of different things from a moving job to trade shows. The Vergo Industrial Hand Truck can be easily used at home or in a business and can handle luggage, a variety of boxes, large water jugs, groceries and a variety of other items. It has a telescoping handle as well as a foldable nose plate, wheels that are nestable, a lightweight aluminum frame with rubber wheels that need no air. It measures when open 42.5” x 19” x 13.5” and measures 31” x 19” x 2.5” when folded. The nose plate is 19” x 13.5” and it weighs just 10 pounds. The rubber wheels of this folding hand truck is larger than most other hand trucks being 7” instead of the standard 5”. A feature some users commented on liking quite a bit is the folding wheels and how easy they tuck away when you are ready to store the hand truck. Others have commented on how well built the hand truck is and that it is sturdy and well balanced making it easy to use. One major complaint mentioned by some users is that even though the large space on the hand truck is so the wheels can store away easily, it can be a problem with smaller items falling through and bungee cords are needed to make sure nothing slips through the space. Before purchasing a handtruck, some of the users that we surveyed had a variety of different questions, including how a handtruck works, how to replace hand truck wheels, how to use hand trucks on steep stairs, as well as how to inflate hand truck tires and repairing tires that have a leak or a blown out. In general, there are some great YouTube videos that dive in depth into these various questions- and we have posted some of them in this section to help explain proper maintenance of these folding hand trucks as well as responses to common questions that you have prior to making the investment in one of these heavy-duty options. When we examined what purchasing considerations buyers had, we saw that many were examining the load capacity, the mechanism of folding, whether the handles were telescoping or not, whether the wheels were retractable, how resilient and durable the frame of the folding handcart was, whether it was a USA-made product, and the sort of warranty the manufacturers provided. 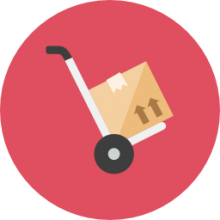 How to use dollies & hand trucks to make your next move easier! On the whole, the different hand trucks that we examined come with some different features, but in general, customer feedback, regardless of the model they chose to purchase, was overwhelmingly positive. If you are looking to purchase one of these hand trucks, it could be that you need it for a trade show exhibition, to handle heavy luggage, to move heavy boxes about in a warehouse, or even your home or office. As we have previously examined, it seems that the most frequent way that these items are used is if you are a musician that needs to haul around different amplifiers, guitars and other musical paraphernalia to different event locations to perform. As well, if you are the parent of a child attending university, you are all too familiar with the hassles and hazards of transporting them to the dormitory- using one of these folding hand trucks is a great way to simplify the process and make it easier for everyone when they go off to college. One bookseller that we surveyed describes how useful these carts are for handling his extensive inventory when he goes to different book-selling events. He can fold it up and store it inside of his compact vehicle and unload his extensive literature inventory at the start of the convention and then pretty easily pack it all back up when he goes home for the day. Heads of households often store them in their garages or basements, leaning up against the wall, or hanging them from a hook, for easy and quick access should they need to cart something from their car to their home, or even transport heavy items like big-screen TVs and 100 lb. potted plants around the home. One complaint that we have seen, is that with shorter trucks, the axis has a tendency to fall behind the handle, which means that when it is loaded the handtruck can fall strongly forward suddenly and you have to be prepared for this jerking movement so that the whole thing doesn't collapse on the ground. One other complaint that we have seen is that for taller users, you might want to do some extra measurements prior to purchase because the handtruck may be a little bit too small for you, even when it is adjusted its greatest height. In all, these are fairly useful and sturdy devices should you need to transport heavy items around within your house, at work, or outdoors if you are on a camping trip or Safari, for example.